Real Madrid eked out a 2-1 victory against Bayern Munich in their first leg encounter of the 2017-18 UEFA Champions League tie at the Allianz Arena. The win gives the holders a vital advantage going into the 2nd leg tie at the Santiago Bernabeu in a week’s time. 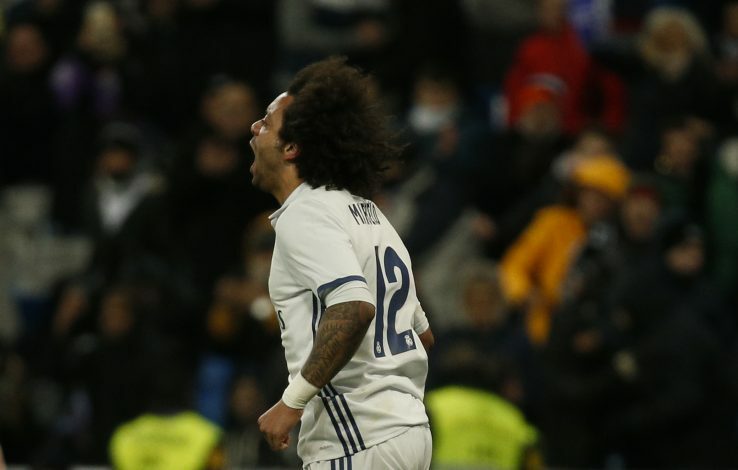 One player who really shined in the match was Marcelo. The Brazilian equalised for Real in the first half, after Joshua Kimmich had earlier scored for the hosts in the 28th minute. The Brazilian left-back continued his sublime form in the Champions League after smashing home a half-volley from the edge of the penalty area. It was a superb goal by the defender, and it helped Los Blancos get into the game with a lot of confidence from there on. Marco Asensio then netted the winner to settle the tie and help Real beat Bayern for the sixth successive time. But one thing that caught the eye in the match was Marcelo trapping the ball from Raphael Varane’s lofted cross pass. The star full-back controlled the ball with fine precision, and it looked very pleasing to the eye. Watch it for a hundred times, and one will still wonder as to how brilliant the piece of skill was by the star defender. This isn’t the first time that he has done this sort of a thing. Earlier in the Madrid derby in La Liga, the player took a mesmerising touch to give the ball to Isco at the closing stages. The gifted player has time and again shown the gift he possesses in such moments with the ball. No wonder he is regarded as the best left-back in the world at the moment.